Today we're going global! Jane from Janezworld.com has agreed to take us along what Christmas is like for her in Australia! I just love to hear how other's celebrate their Christmas, and thought this was an especially good treat to see how someone not in the US does it. Let's sit back and enjoy the tour, shall we? Hi everyone, I am Jane from Life @ Number 8, where I blog holistically. http://janezworld.com/blog. Feel free to stop off at my domain Janezworld.com & visit my other blogs, plus the original Life @ Number 8. A few months ago I worked up the courage to move to a self-hosted blog. I live at the bottom of the world, well almost. If you are in the northern hemisphere, I’m a day ahead of you; my nights are your days. Your winter is my summer. Christmas in the Southern Hemisphere is different in many ways to what Northern Hemisphere dwellers are used to. First off, it’s likely to be hot. Even very hot. Or sweltering. I have been in Christmas day weather where the temp was over 40C (100F plus) degrees. Actually 2 or 3 of those days. These were in the years before we had air conditioning. Yes they were every bit of the challenge you are imagining. We would sit down about 1pm to a traditional Christmas dinner of baked turkey, ham and roast vegetables, gravy, fresh peas we had shelled that morning, and in time cranberry sauce; when it began to appear on the supermarket shelves. I have never seen fresh cranberries. When we moved north some seventeen years ago I changed how we celebrated. Breakfast became a big deal. In the spirit of the season, we open our home and hearts inviting many single, on-their-own, elderly and some lonely friends to join us. I think our biggest crowd was 32. Everyone is invited to bring something along to contribute. We have an annual menu of cereal, fresh fruit, especially mangoes, ham, bacon, eggs, pancakes, maple syrup, croissants, toast, juice and hot chocolate. Christmas music fills the air. Laughter and chatter ease away any sorrow and grief. 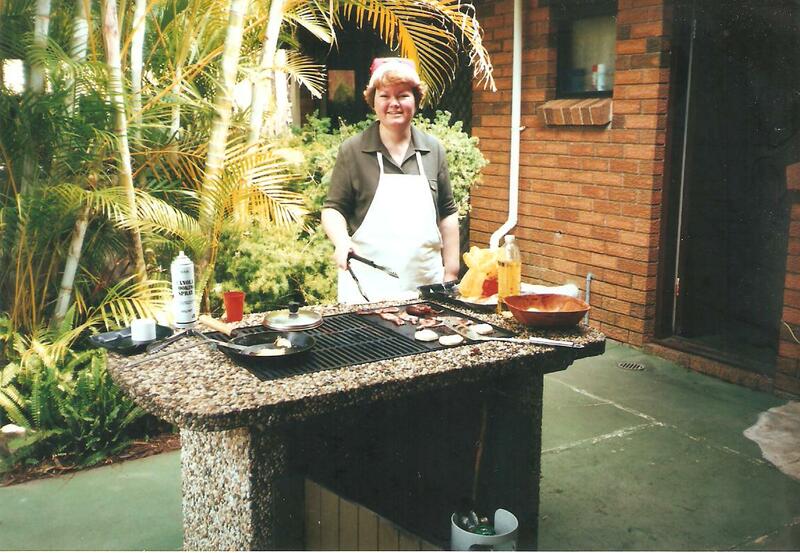 By the time we had a house with a large rear patio and fantastic BBQ I was prepared to be the chef on duty. That’s me in the photograph – many many ago – complete with Santa hat. Before our guests arrive we open our stocking gifts. We all have one person to shop for. The rules are: no more than $10 spent in total, and no more than $2 per item. Each has to be specific to the person. We have had some very creative surprises. One year my son who hates green vegetables received a stocking of all green things. About 3pm I prepare the turkey with apricot and macadamia nut stuffing, and put it into cook: long and slow. We gradually prepare all we need for a traditional candlelight family dinner about 8pm. We love the coolness of the evening. We aim for an elegant traditional setting. This is one of the ones we used. We found we liked gold and white, so mostly we stay on that theme. Because I hate sand, and seafood we do not go to the beach, or park, though many Australian and New Zealand families do. Thanks Jane! I know sometimes here in Florida we do have an occasional unseasonably cold weather...just no snow... but to have summer in Christmas??? Wow. That's something I can't imagine! LOL. Thanks again for being my guest today and sharing your Christmas with us!